In Seoul, A Plastic Surgery Capital, Residents Frown On Ads For Cosmetic Procedure : Parallels South Korea has the world's highest per capita rate of plastic surgery procedures. 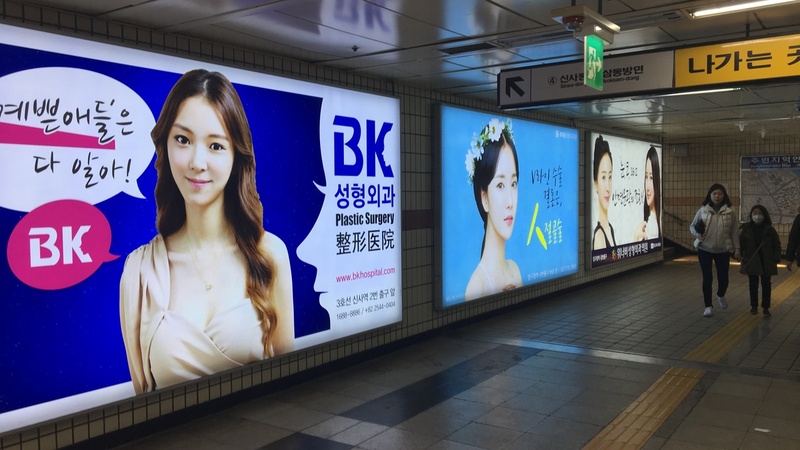 But growing pushback against ads touting facial fix-ups has prompted Seoul's public transport system to ban the ads. Every ad in the Seoul Metro's Apujeong station is for a plastic surgery clinic. 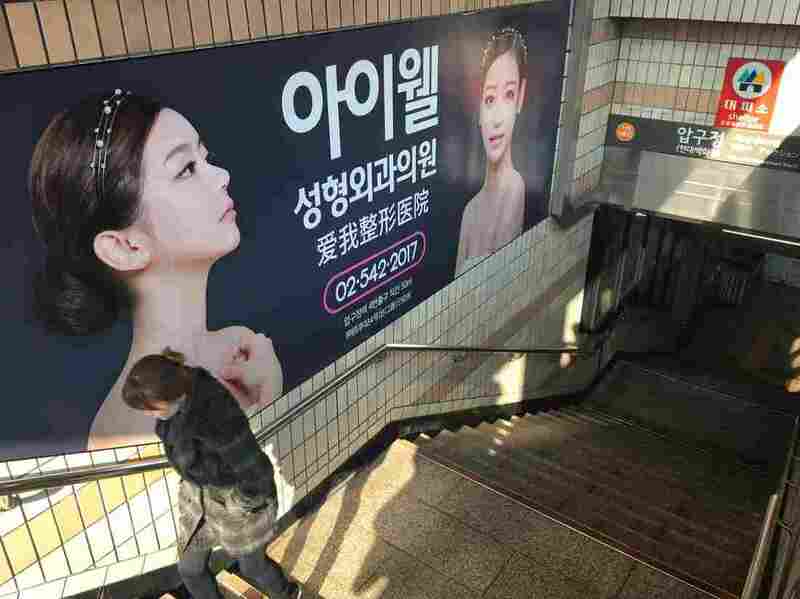 In response to a growing number of complaints from riders, the Seoul Metro announced it will ban advertisements for cosmetic surgery at its stations. Ads for plastic surgery clinics line both sides of the stairwell going into a subway station in the Gangnam district of Seoul. Cosmetic surgery tourism attracts so many people — mostly from Japan and China — that Seoul's Incheon airport at one point considered putting a plastic surgery clinic inside a terminal so travelers wouldn't have to go into the city to finish their procedures. (That proposal was scrapped after opposition from doctors). But Koreans are starting to question the proliferation of cosmetic procedures. In response to a growing number of complaints from riders, the Seoul Metro, which runs the capital's public bus and subway system, announced in November that it will ban advertisements for plastic surgery at its stations. "Please regulate large ad displays of makeovers through plastic surgeries ... It's unpleasant to see them in public spaces." "Do more strict screening of ads that excessively promote surgery and aggravate discrimination against women." "Advertisements that sexually objectify and commercialize women are uncomfortable to look at. Please do not authorize advertisements that reject gender equality." Seoul Metro says the number of complaints has ticked up steadily since 2015, prompting it to take action. But Willoughby says the problem is much broader. "Much of the ideal [beauty] is industrialized. It's being created by the beauty industry, by K-pop [Korean pop music], by perhaps even the government, in what they're selling to the rest of the world as to the ideal Korean beauty," she says. Bora Ki, who rushes past cosmetic surgery ads every day, calls them "horrible." "All of the women look the same," Ki says. "So I think it's not positive." The sameness she mentions is striking. Willoughby says it reflects the standard beauty ideal prized by Koreans: ivory skin, big, round eyes with the Western-looking double eyelid and a V-line jaw. "There's just a sense that to conform, to be part of that norm, you have to look a certain way, act a certain way," Willoughby says. Kim Sook-in, who makes her living as a porcelain artist, doesn't question cosmetic surgery or the prolific ads promoting it. "It's every woman's desire to become prettier, so I think it's a good thing," Kim says. Willoughby says Seoul residents — especially younger women and girls — could stand to see fewer reminders about how much looks matter. "When young girls see this over and over and over, they subconsciously are told they have to be a certain way. So seeing less of it or seeing a greater diversity is a much better and much healthier thing," she says. These ads are on their way out — but not anytime soon. Because of existing ad buys, the Metro says it doesn't expect to phase out all the subway's gleaming plastic surgery promotions until 2022.